Politics • Bill nears final passage to create presidential primary; counties  not parties  would run such elections. Leah Hogsten | The Salt Lake Tribune Lines and wait times were long at the Democratic caucus at Mountain View Elementary School as both registered party members and unaffiliated voters cast their ballots, Tuesday, March 22, 2016. 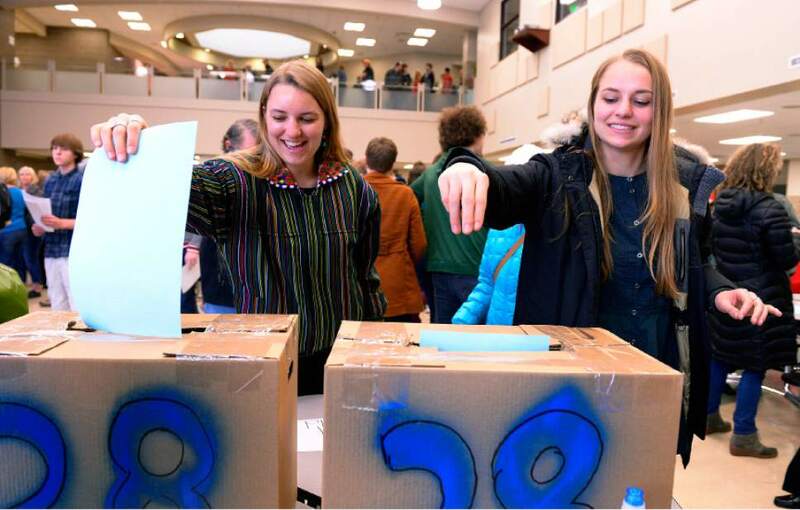 Leah Hogsten | The Salt Lake Tribune Sage Mack, 19, (right) drops her ballot in the ballot box and casts her first vote ever with her sister CoCo Mack (left). Lines and wait times were long at the Democratic caucus at Clayton Middle School as both registered party members and unaffiliated voters cast their ballots, Tuesday, March 22, 2016. A bill to create a presidential primary in Utah  and address problems with caucuses last year that included amazingly long lines, insufficient parking, and ballot shortages  took its next-to-last step toward passage Tuesday. The Senate Government Operations Committee voted 5-0 to pass HB204, and sent it to the full Senate. It previously passed the House 56-15. "Political parties should be in the business of trying to win elections, not run them," said Rep. Patricia Arent, D-Millcreek, sponsor of the bill. In a primary, she said people may vote all day, vote by mail or absentee ballot or use early voting  and it is run by professionals. But in last year&apos;s caucus, parties used volunteers to compress voting into a few hours in the evening. "There were people who couldn&apos;t vote because there was no parking, they were elderly, they couldn&apos;t stand in line, it was cold, they were there with their families and their children couldn&apos;t stand in line," Arent said, adding that people who had to work could not vote. Also, the Utah Republican Party tried to allow some to vote online. But problems prevented 10,000 out of 40,000 who had signed up for that from actually casting ballots. 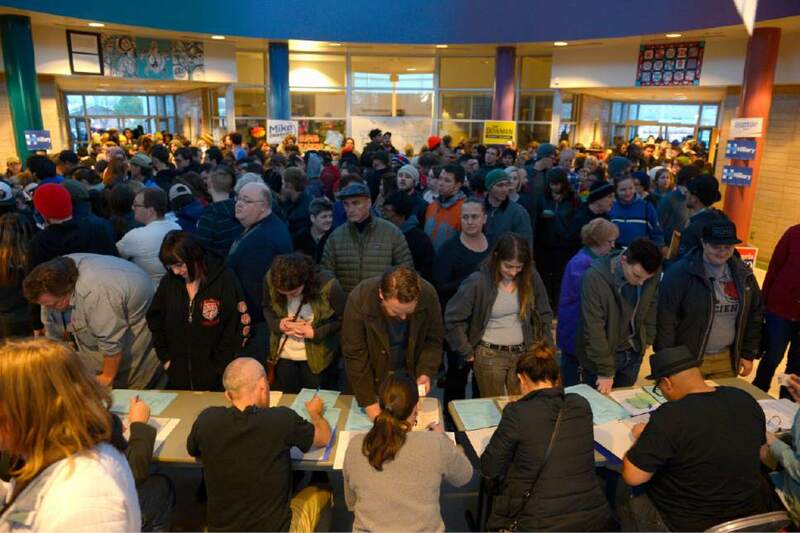 Because of the chaos and long lines, Arent said, "We thought, &apos;Wow, there are a lot of people  what a great turnout.&apos; Actually, 53 percent fewer people voted in that presidential caucus last year than in our primary in 2008." Both the Utah Republican Party and Utah Democratic Party supported the bill. Last year, Utah Republicans insisted on a caucus  but Party Chairman James Evans testified for the bill on Tuesday, saying his party has not decided whether it wants a primary or caucus in 2020, and wants to keep the option open for a primary. Gov. Gary Herbert has supported holding a primary, and put money in his budget for one last year  although it was not adopted by the Legislature. Arent also read a letter from former GOP presidential nominee Mitt Romney  sent to the Legislature in 2016  urging it to hold a primary, saying it allows more people to vote. "It is important that every person has the right to vote," Arent said. "We want to make it easier for people, not difficult." Legislative analysts figure a presidential primary will cost $2.6 million every four years. "Democracy comes with a cost," Arent said. Sen. Daniel Thatcher, R-West Valley City, said he is glad for the chaotic caucuses last year. "It&apos;s where I met my wife," he said. "I will be eternally grateful we got it wrong at least once." Arent said, "I&apos;m so glad to hear that something good came out of that chaos."